In order for growth activities to be successful, you as the facilitator should know your purpose, your audience, your environment, the needed equipment and supplies, and when to change plans to adapt to the participants. These activities harness the power to view images instantaneously in order to help group members learn more about themselves and how they interact with each other. This activity encourages users to see the Internet as a tool that they can use for growing in relationship with fellow team members and others by thinking about how pictures, posts, and other information can be interpreted in various ways. If a team is to function and grow effectively, its members must be able to communicate clearly and sometimes quickly. Certainly, text messages are quick and convenient, and the activities presented here help users understand and meet the challenges that text messaging creates. Music is more accessible than ever before. People simply log on and download whatever they like, and this ease of access has helped create a generation that often seems to live for music. You will quickly see evidence of this dimension of young people’s lives as you progress through the audio activities presented in this chapter. Teens and young adults have connected with technology in unprecedented ways. Take a look at your average high school or college campus and you’ll see what a huge part technology plays in their lives. Computers, wi-fi networks, smart phones, and MP3 players allow young people 24/7 access to technology. 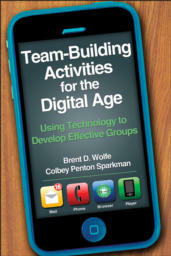 Team-Building Activities for the Digital Age will show you how to use that technology to help them connect with each other, too. Resource for recreation, outdoor, camp, and youth leaders; reference for college and university professors and recreation professionals who teach or use team building in courses or in staff training.